By Deron Wagner|trading education articles|Be the first to comment! When market conditions are solid, breakaway gap ups are a powerful buy signal that can produce gains of 40-100% in just two to three months of trading. Breakaway gaps have produced some of the biggest movers in our Wagner Daily model portfolio throughout the years. In 2017, we bought Applied Optoelectronics ($AAOI) after a breakaway gap up — it rallied 90% in less than two months. Not all breakaway gaps hold or follow through to big gains, but these types of stock trades have fantastic reward to risk ratios that make them hard to pass up. CONTINUE READING to find out how to find breakaway gaps and when to buy them for the greatest trading profits and lowest risk. We’ll also show you an actual example of a breakaway stock trade that we are now long to tie it all together for you. Breakaway gaps should occur following a valid basing pattern of at least five weeks in length. A stock that gaps above the highs of a two to three-week consolidation is a “continuation gap,” which may be fine for a swing trade, but not what we are looking for. Volume is extremely important when evaluating the strength of a breakaway gap. On the day of the gap, volume should be at least three times greater than the 50-day volume average. The stock should be up more than 5%, and as much as 20-25%, by the end of day. Any stock that fills the opening gap should be avoided. For the 5-25% rule, stocks that have a big ATR relative to their price can gain 20% in a day and still have plenty of upside after a short pause. In general, we aim to stick with stocks that have strong earnings and revenue growth. The most aggressive buy: Buy� after the first one or two minutes of trading (to make sure the stock doesn’t sell off immediately on the open). You could enter half the position on strength, as the stock moves higher intraday, and place a stop 5-10% below the entry. Wait for a tight-ranged inside day on lighter volume to print within a few days of the gap. Just above the high of the inside day is the buy stop that should enable momentum to follow-through to the upside. If a stock fails to follow through and stalls, then the first test of the 10-day moving average (MA) can serve as a low-risk entry point. You could buy over the high of the day that tests and holds at support of the 10-day MA. If the price action stalls for two days in a row, with almost the same high for each day, you may place a buy stop over the two-day high. In this scenario, both days should be relatively tight-ranged. If the 10-day MA fails to hold, then a test of the 20-day exponential moving average (EMA) could be in play, but you should wait for a� bullish reversal candle to print before entering off the 20-day EMA. If the 20-day EMA fails, then continue to watch the stock for a bullish reversal bar to develop on the daily chart, at or near the 50-day MA, as long as the gap was not filled. 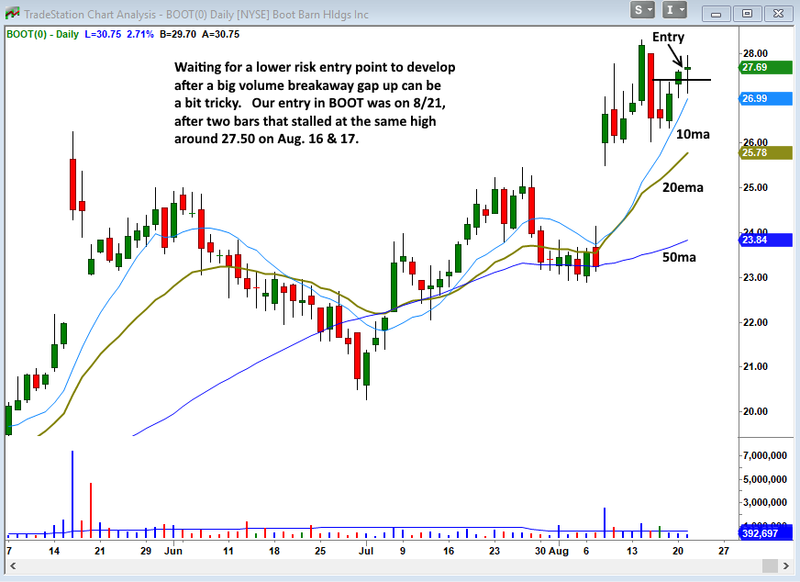 Let’s go over a recent breakaway gap up entry we purchased in our nightly stock trading newsletter, The Wagner Daily. On August 8, $BOOT gapped open just above the high of its recent base, then closed the day with a 14% gain. Volume was four times greater than average that day, confirming the validity of the breakaway gap. This breakaway gap up enabled $BOOT to convincingly break out above the highs of a three-month long valid basing pattern (remember the base should be at least five weeks). 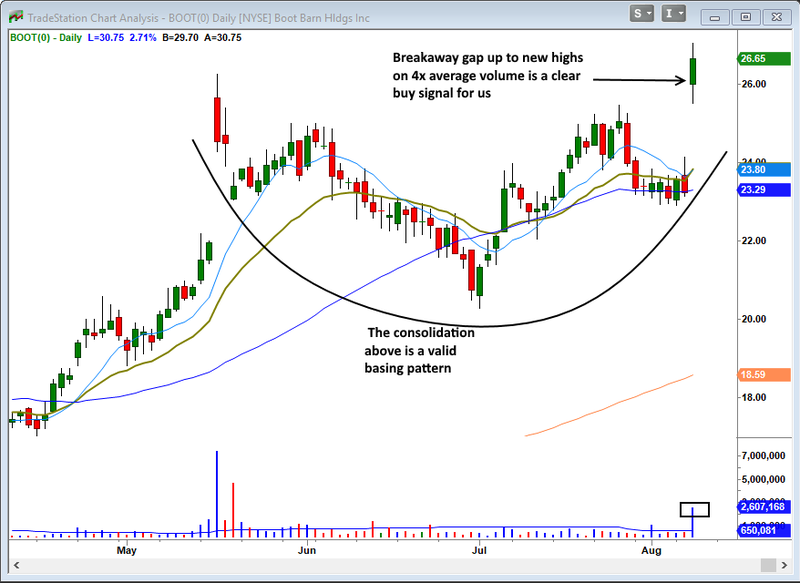 We did not buy the stock immediately after the breakaway gap, but the bullish price action forced the stock onto our internal watchlist for potential trade entry. 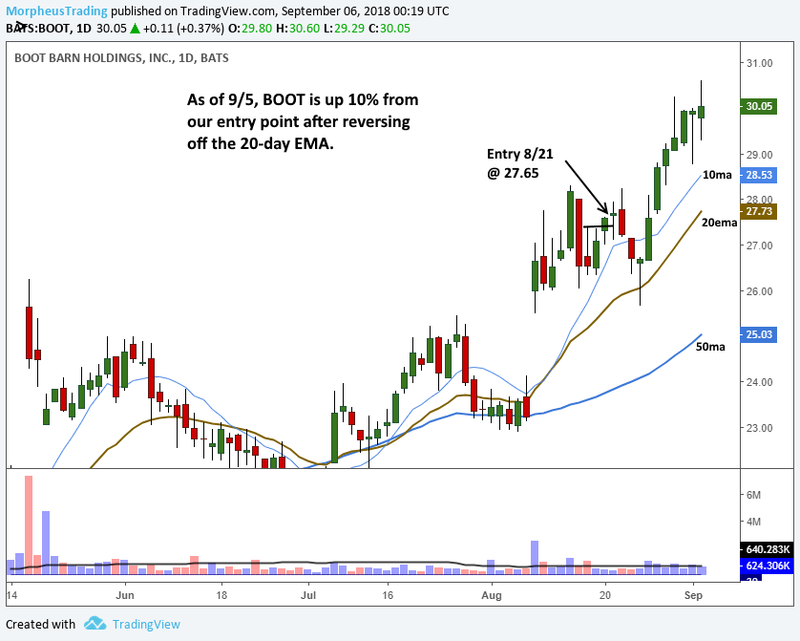 We had a valid buy signal to enter $BOOT on August 14, after the stock rallied above the high of the tight-ranged, light volume day on August 13. However, we missed that entry point and instead waited for the next low-risk entry point. We noticed the price action tightening up on August 16 and 17, with volume drying up on the 17th (see #4 on second list above). As such, we placed a buy stop to enter above the high of August 20, with the rising 10-day MA and 20-day EMA providing support just below. On August 21, the $BOOT trade triggered our buy stop and we notified Wagner Daily subscribers of the new trade entry. Boot Barn shares failed to move higher right after our entry, which led to a pullback and shakeout. Surprisingly, the 10-day MA offered no support and $BOOT swiftly sold off to the 20-day EMA. It can be mentally challenging to continue holding a stock through a shakeout, but we followed our trade plan and stuck to the original stop price (below the low of the gap). But the stock closed quite strong, at its intraday high, and formed a bullish hammer candlestick pattern. From there, the stock rocketed to new highs with seven consecutive days of gains. We are still long $BOOT and the trade is currently showing an unrealized gain of +10% in our swing trading newsletter. The 10-day MA and 20-day EMA have risen higher, and are now ready to provide support in case of another pullback. A bit of sideways action and price consolidation from here would be expected and healthy. Then, we expect another wave higher. The breakaway gap up is an excellent type of trade with a high reward to risk ratio. In a healthy stock market, you can often risk just 5-10% and come away with gains of 40-50% or more. Further, the breakaway gap gives you multiple chances to enter the trade if you miss the first or second valid entry (as we did). What do you think of this excellent momentum trading strategy? Drop us a comment with your thoughts below.